I suspect deep down I enjoy being disapproved of. It may explain my adoration of a former bartender at the Russian Samovar. It may also explain my new favorite fish, the polka dot batfish (or maybe it is the shortnose batfish). I have experienced fish being wary, hungry, curious, and ambivalent, but never before have I felt disapproved of by a fish…until now. We were snorkeling at Jaws Beach when Patrick and Garnet came to tell me about a weird fish they saw. I found one a few minutes later. We were excitedly telling each other about the weird face, the stubbly legs (pelvic fins), and the awkward pectoral fins that looked like wings. 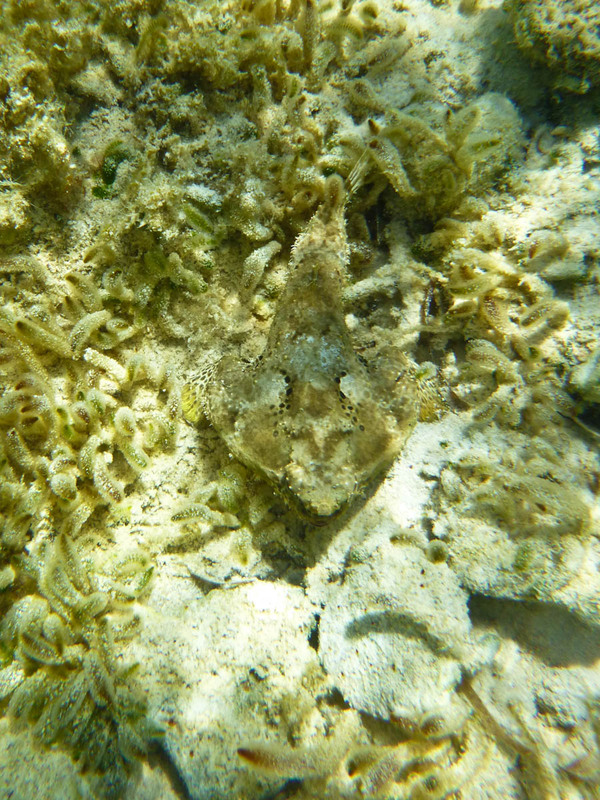 We had never seen such a thing and frogfish and sea robins leaped to mind, but neither seemed right. 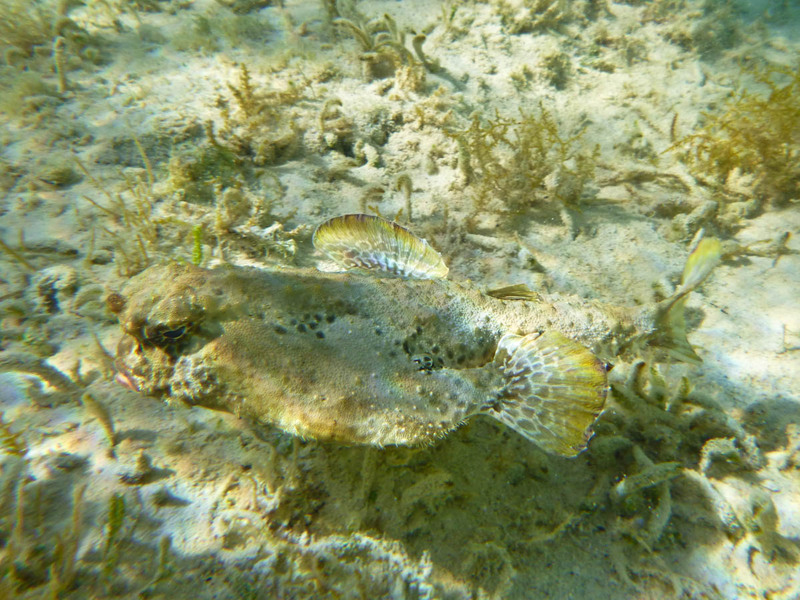 Research turned up batfish and several species were cited as living in the shallows in the Bahamas. I’m going with polka-dot batfish* for this article because the coloration was the most similar. 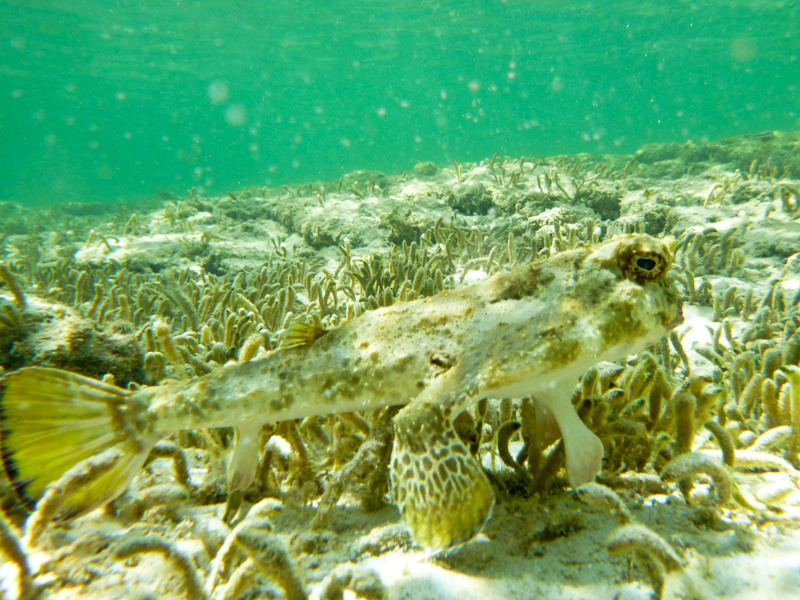 According to Guide to Marine Life: Caribbean, Bahamas, Florida, “Polka-dot batfish have distinct spots on the fins, head and body, while shortnose batfish are generally more mottled. 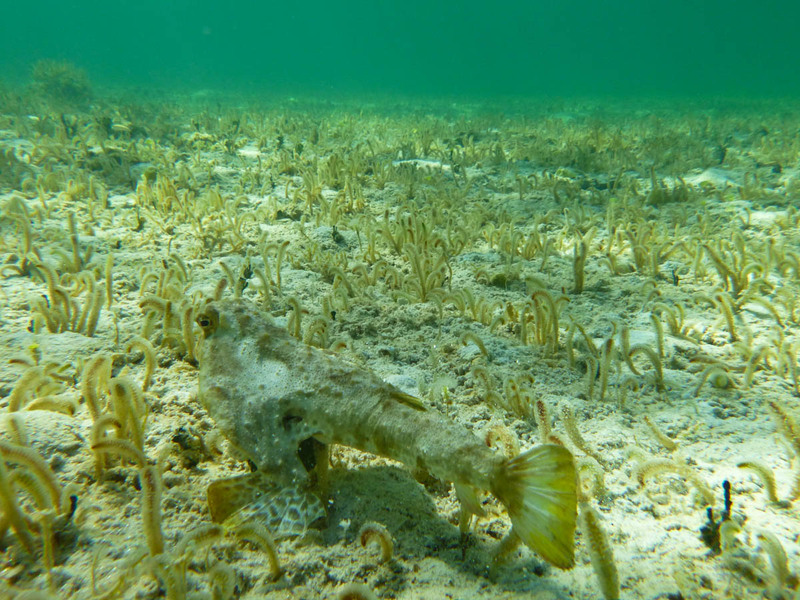 The polka-dot batfish is not found in the true Caribbean, but it has been documented in the associated waters of Florida and in the Bahamas.” They are usually between 6-12 inches long, which matches the ones I saw. Batfish are in the anglerfish family and many live deep along the ocean bottom, but a few, like the polka-dot species live in shallow waters. They generally sit around on the bottom of the sea and wait for prey to come to them. 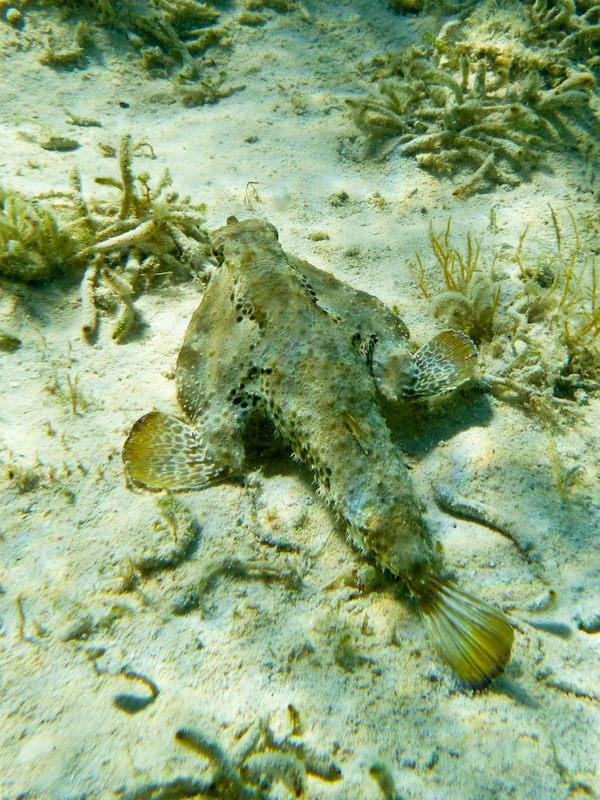 They are masters of camouflage, blending in with the sand and sea vegetation. They use that bulbous forehead to lure in their prey, which consists of crustaceans, mollusks, and worms. And they walk. Seriously. When they move, unless they are doing a slow flee, they walk on stubby little pelvic fins. They swim with short pectoral fins that jut out on the side. I was completely fascinated by them. 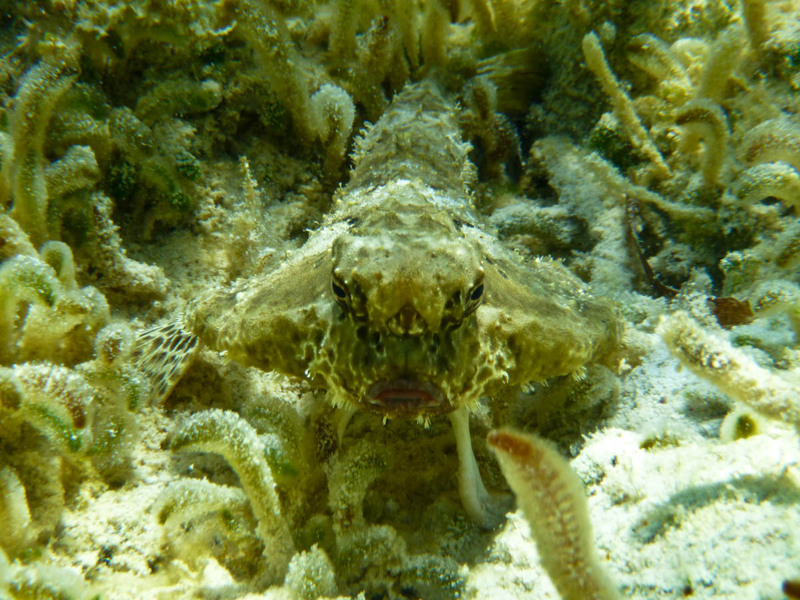 We snorkeled Jaws Beach 3-4 times during our trip and I encountered several batfish. I pestered the hell out of them with my camera and diving down to take a close look at them. I broke my rule of trying not to interfere with animals in the wild. I was so curious. I couldn’t stop myself. I had to touch the batfish. 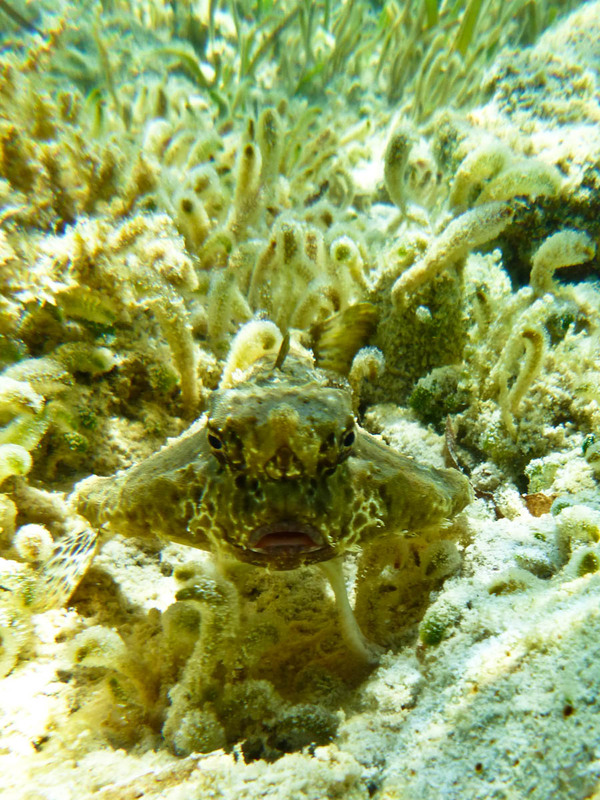 Thus, I received a look from the fish that conveyed I had deeply offended him and should stop these antics immediately. He awkwardly swam 2-3 feet away. The disapproving look was so effective that felt ashamed and I left him alone. In that moment I had a new favorite fish. * If you are reading this and I got the species of batfish wrong please let me know. I almost hope it is wrong so they can disapprove of me further.